After the Republic of Azerbaijan regained its independence, it has become possible to renew the objective picture of the past history of Azerbaijani people. The truth, which for many years was kept back, is getting disclosed and misinterpreted events are getting their real assessment. Numerous acts of genocide committed against Azerbaijani people, which for many years did not receive their deserved political and legal assessment, are one of the lesser known pages of the country's history. The Gulustan and Turkmenchay agreements signed in 1813 and 1828 provided the legal ground for the partition of the nation of Azerbaijan and division of its historical lands. The occupation of the lands continued the national tragedy of Azerbaijan people. Within a short period of time, mass settlement of Armenians began on Azerbaijan's territories. The occupation of Azerbaijani territories became an integral part of the genocide. Armenians moved to Irevan, Nakhchivan and Karabakh khanates and achieved establishing their administrative territorial unit of "Armenian region", despite their minority as compared to Azerbaijanis residing in the same area. This artificial separation provided political reasons for removal and annihilation of Azerbaijanis in their native lands. This was followed by propaganda of the establishment of the "Greater Armenia". In order to ensure the exculpation of the idea to establish this fictitious state in the territory of Azerbaijan, a wide-scale program, aimed at the falsification of the national history of Armenians, was started. The distortion of Azerbaijan's history and the whole Caucasus formed an integral part of this program. Inspired by the idea of the establishment of "Greater Armenia", Armenian invaders, in 1905-1907, started to openly conduct hostile actions against the nation of Azerbaijan on a mass scale. Armenians started their atrocious acts in Baku and further spread them through the rest of Azerbaijan and Azerbaijani settlements in the current territory of Armenia. Hundreds of settlements were razed to the ground and thousands of Azerbaijanis were savagely killed. The organizers of this savagery were creating an unfavorable image of Azerbaijani people, to hide the truth and prevent these happenings from correct political and legal evaluation. Armenians got use of the World War I, Russian revolutions in February and October of 1917, and managed to accomplish their ideas under the plea of the Bolshevism. The implementation of a cruel plan of cleansing the population of Azerbaijani provinces started with the Baku commune under the plea of fighting against counter-revolutionary elements in March of 1918. Armenian crimes have secured themselves an everlasting place in the memory of Azerbaijani people. Thousands of civilians were murdered for the only reason of being Azerbaijanis. Armenians destroyed dwelling houses and burnt people alive. Most of Baku was turned into ruins with national architectural sights, schools, hospitals, mosques and other monuments destroyed. The genocide of Azerbaijanis was particularly cruel in Baku, Shamakhi, Guba, Karabakh, Zangazur, Nakhchivan, Lankaran and other regions. Many civilians in those areas were killed, the villages were burned to ashes and national monuments were razed to the ground. After the establishment of the Azerbaijan Democratic Republic (ADR), the closest attention was paid to the March 1918 events. The Council of Ministers issued a decree on July 15, 1918, to establish an extraordinary committee for the investigation of those tragic events. The committee investigated the first stage of the March 1918 genocide; the brutal acts in Shamakhi and the cruel crimes in Irevan province. A special department was established under the Ministry of Foreign Affairs to notify the community about the truth. The ADR declared March 31 a mourning day twice - in 1919 and 1920. It was the first attempt in the history to give a political assessment to genocide against the people of Azerbaijan and to the occupation of the country's lands, which went on for over a century. But the fall of the ADR did not allow this process to end. In 1920, Armenians got use of the coming of the Soviet power into the South Caucasus, and declared the annexation of Zangazur and other regions of Azerbaijan to the Armenian Soviet Republic. Armenians later started to utilize newer means to strengthen their policy, aimed at the deportation of Azerbaijani people from these territories. For this purpose, Armenians used the December 23, 1947 decree of the Soviet Council of Ministers "On removal of collective farmers and other Azerbaijani population from the Armenian Soviet Republic to the Kura-Araz lowlands of the Azerbaijan Soviet Republic". During 1948-1953, they finally achieved the purpose of mass deportation of Azerbaijani people from their historical lands, at the state level. In early 1950s, Armenian nationalists with the help of their defenders began to conduct a cruel aggressive campaign against the nation of Azerbaijan. In regular published books, magazines and newspapers in former Soviet Union, the attempts were made to prove that Azerbaijani national culture, classic heritage and architectural monuments belong to Armenians. At the same time, Armenians strengthened their efforts to create a negative image about Azerbaijani people worldwide. In order to create the image of "a long-suffering oppressed Armenian nation", the Armenians deliberately distorted the events which took part in this region in the beginning of the 20th century. They called themselves the victims of the genocide, which they in reality conducted against Azerbaijani people. Persecution of Azerbaijanis in Irevan, where the main population consisted of Azerbaijanis and from the other parts of Armenian SSR, led to their mass proscription. Armenians violated the rights of Azerbaijani people, created the obstacles to get the education in native language and exerted a strong pressure upon them. The historical names of Azerbaijani villages were changed within a previously unforeseen process in the history of toponymy, when ancient names were replaced with the modern ones. The trumped-up Armenian history was raised at the state political level in order to bring up younger generations of Armenians in the spirit of chauvinism. Brought up in the manner of Azerbaijani literature and culture, which served to great humanism ideals, the young generation of Azerbaijanis was persecuted by the followers of Armenia's extremist ideology. The claims against the Azerbaijani national spirit, honor and dignity, created an ideological platform for the political and military aggression. 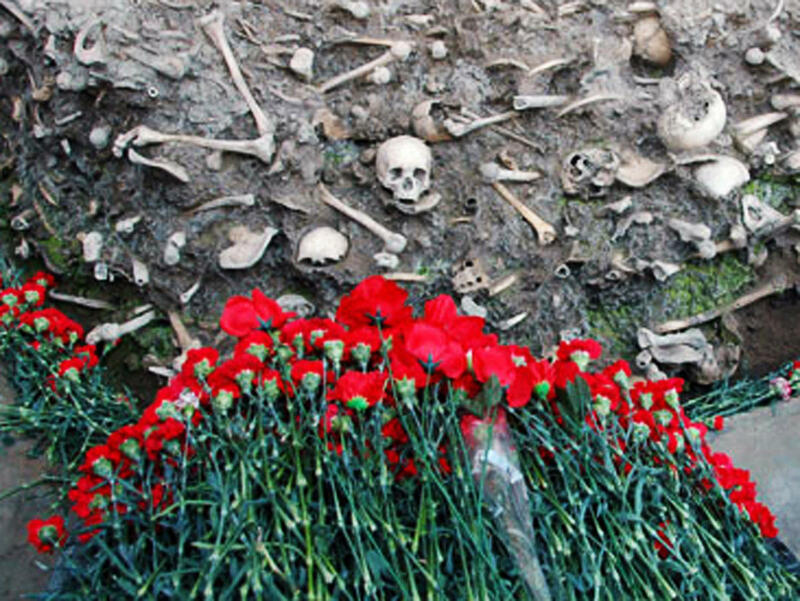 Azerbaijani genocide, which was not given a correct political and legal evaluation, led to distortion of historical facts in the Soviet media and misleading of the communities by Armenians. The leadership of Azerbaijan did not pay the sufficient attention to anti-Azerbaijani propaganda, which raised and intensified among the Soviet regime in mid-80s. The deportation of hundreds of thousands of Azerbaijanis from their historical lands at the first stage of the Nagorno-Karabakh conflict in 1988, also did not receive a correct political assessment in Azerbaijan. Nagorno-Karabakh was taken from Azerbaijan's control and annexed to the Armenian SSR at the basis of an unconstitutional decree of Armenian Republic and under assistance of the Moscow-led Special Administration Committee. This fact caused a serious dissatisfaction in Azerbaijan and forced it to begin important political activities. Even though the aggressive policy aimed at the occupation of the territories of Azerbaijan, was strongly criticized at numerous rallies held in Azerbaijan, the political leadership still did not give up its passive and contemplative position. In January, 1990 the Soviet troops were brought to Baku in order to prevent further development of the national liberation movement. Hundreds of Azerbaijani people were killed and injured, as the result. In February, 1992 Armenians accomplished unforeseen brutalities in Azerbaijan's small town of Khojaly. The Khojaly genocide saw thousands of Azerbaijanis murdered and taken as war prisoners. Khojaly itself was razed to the ground. The adventurous policy of Armenian nationalists and separatists in Nagorno-Karabakh, forced over one million of Azerbaijani nationals from their homelands. Today, they live in tent camps. Roughly 20 percent of Azerbaijani territories were occupied by Armenian armed forces, and thousands of Azerbaijani citizens got injured and became martyrs. The tragedies, which took place in Azerbaijan in the 19th-20th centuries and resulted in occupation of Azerbaijani lands, formed the consecutive stages of Armenia's purposeful policy against the Azerbaijani people. Efforts were made to give a political assessment to only one of those events - the March 1918 massacre. The successor of the ADR – the Republic of Azerbaijan - considers it a historical duty to ensure a logical continuation to unfulfilled political decrees and political evaluation to the genocide.